Your kids will love them, and so will you! Dried mangoes with absolutely no preservatives? It doesn't get any better than that! Unopened and kept at room temperature they will last you a whole year, you can stock up now and not worry about snacks, entertaining guests, or an energy boost throughout the day! This is one of Steve's Goods' bestselling items for a reason! 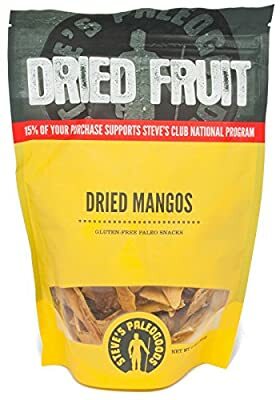 A single re-sealable bag containing 6.0 oz of delicious fruit Each serving of dried mango has a fifth of your daily Vitamin C. One ingredient only. No preservatives. 100% mango! Comes in a re-sealable and re-usable container. Perfect snack to grab-and-go with no mess!